So yesterday I purged my own closets and drawers, today I'm tackling my boys spaces! It seems like buying, sorting, storing and purging kids clothes never ends. When Grayson was born, I held onto everything "just in case" we ever had another child. Although I am so lucky to have two boys and can therefore get twice the use out of clothing items, it is a major production to figure out which clothes will fit which boy at which time! The boys are now 10 and 6 and I've come up with a simple system that has worked for us for the past few years. It makes sorting and purging a little easier. 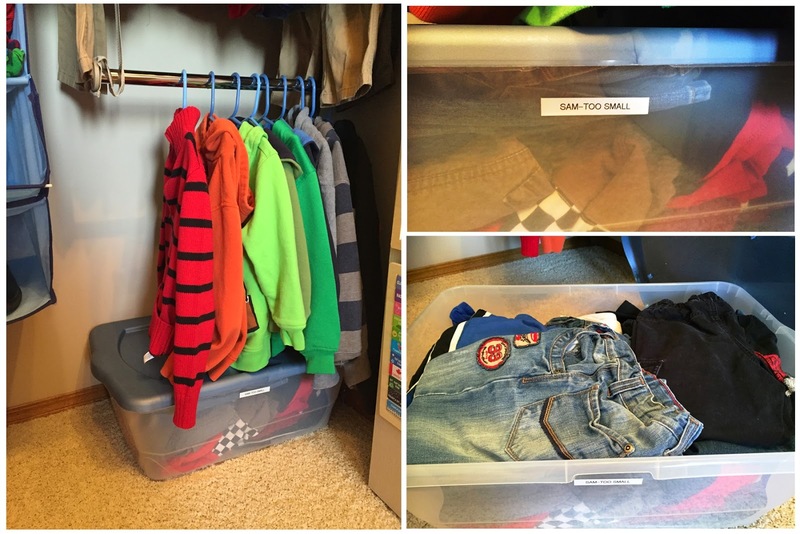 Each boy has a large bin on the floor of his closet labelled with their name and "Too Small". The idea is that when either boy outgrows something that is still in good condition, it gets folded up and put in his Too Small box. The reality is that some items are just too worn out to be passed along and have to be thrown out or used for rags (and my boys seem to be very hard on their clothes - are yours?) and sometimes the Too Small clothes end up just being left in drawers or the closet until mom deals with them, 'cause boys just don't think of that kind of stuff! But overall theses boxes are a great idea because they are a dedicated spot to hold clothes the boys outgrow until I decide what to do with them. I go through his current clothes. Things that are too small or that will be too small by the next year get added to his Too Small box. I sort and hang or fold all the clothes that he will keep and wear. 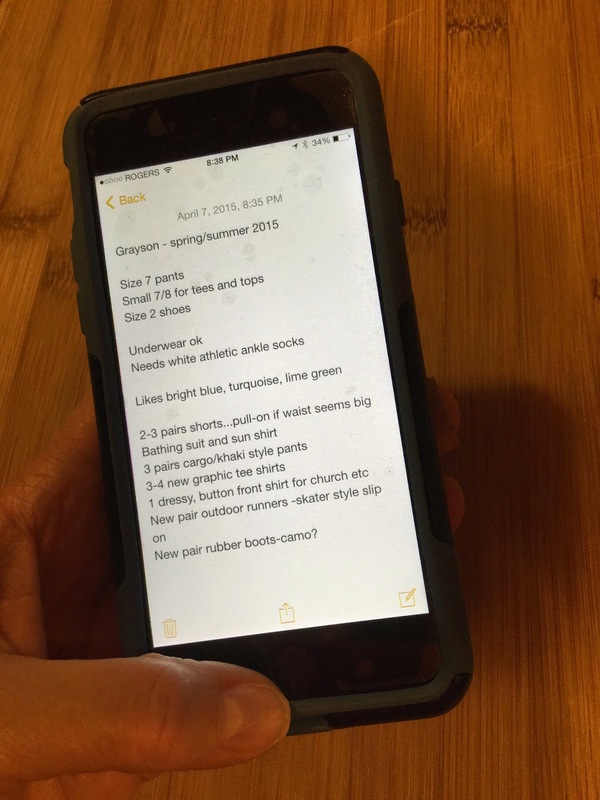 Then I make a list in the Notes App on my phone of what he will need for the upcoming season - noting sizes, color preferences and any special occasions or seasonal events that are coming up, like sports, camps or weddings. I also make sure to check his socks, underwear, pj's, shoes, boots and outerwear to make sure they fit and are in good repair - we ain't keeping any hole-y socks and undies! Then I move on to Sam. I revisit Grayson's "Too Small" box and see what will fit Sam and might work for him in the upcoming season. Those items then get moved into Sam's room. 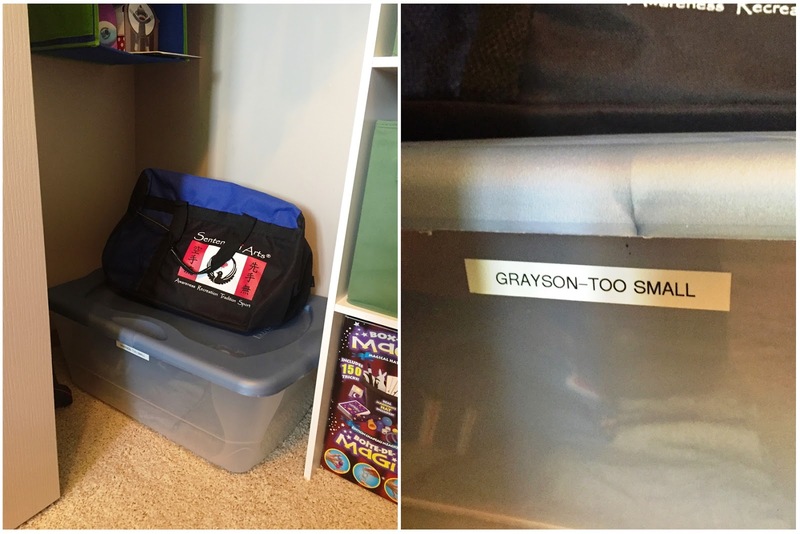 The rest of the Too Small items stays in the box in Grayson's closet until next season. Then I follow the same procedure as I did for Grayson - I go through Sam's current season clothes to see what he has outgrown or which items need to be replaced. I add outgrown items to his Too Small box and fold or hang the rest of the items that he will keep and wear. I check his socks, underwear, pj's, shoes, boots and outerwear too, and make a separate list on my phone of what Sam will need for the upcoming season. Finally I bag up the items now in Sam's Too Small box to be dropped off at a charity drop-bin or brought to Goodwill or Value Village. It's never a super fast process, but I don't mind spending a couple of hours two or three times a year get both boys sorted out instead of trying to deal with outgrown clothes several times haphazardly throughout the year. Also, I'm not a big fan of shopping, so having the lists I need at my fingertips means I can purchase items while I'm getting groceries at WalMart or Superstore, or even take advantage of flash online sales. 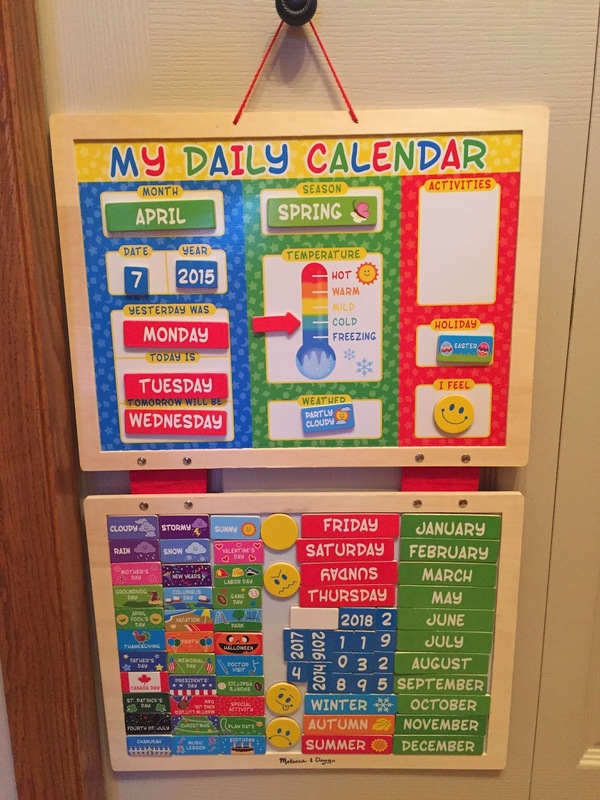 Bonus Organizing Tip: I know keeping kids closets clean and organized can be a pain. While Grayson's room has a fairly spacious closet, Sam's closet is much narrower with only a single rod and shelf. I didn't want to install a closet shelving system as it was just too narrow and I figured he'd lose a lot of the precious little hanging space he had. So I got a rod doubler (like this one) which allowed some division and organization possibilities, and a hanging shelf (like this one) which is great for separating outfits for each day of the week or just to use as extra shelves. On the single top shelf I have a couple of bins (empty right now - we used to use them for diapers and wipes storage) and a large bin for his baby memorabilia. The Too Small box fits underneath the bottom row of hanging clothes and there is still a bit of breathing room. 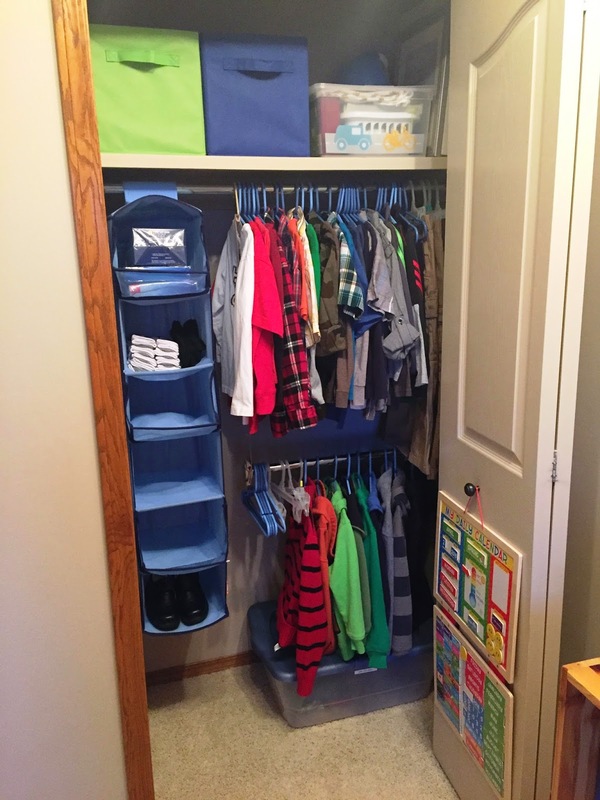 Hopefully this gives you a few ideas if you're dealing with a small kids closet too! What are your strategies for dealing with kids clothes? Especially if you have many children? I'd love to have you share some tips below! I'm happy to say that I am on track with my five bags in five days goal - I now have two bags in two days and a couple of new lists in my phone. Tomorrow I'm taking on books and toys - YIKES! Join me and see how I do!